The research from US-based digital marketing agency, Fractl, examined the one million most-shared articles across the main social networks during the first half of 2016. From the one million stories, Goal.com generated 249m shares, placing the football news site above the BBC (248m) and Buzzfeed (186m). Goal is the world’s largest football website and part of the Perform Group of sports media brands. Goal’s 500 journalists cover football across 19 languages with 37 local editions. It has 52 million fans on Facebook, making it the largest, as well as the most shared, football media brand on the social network. Fractl’s research regards a ‘share’ as an action that generated a story in a fans’ newsfeed, such as reacting, commenting or sharing a story. Of the one million stories analysed, 73,000 came from Goal, with, on average, each story being shared just under 4,000 times. 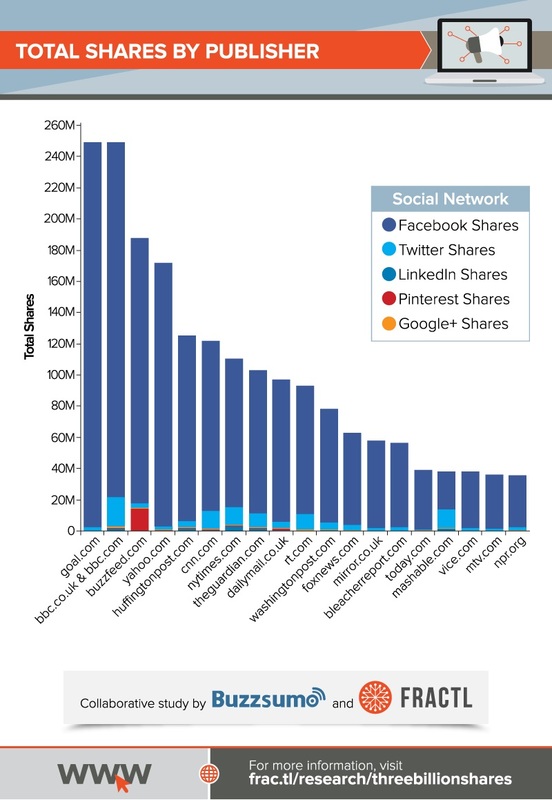 “Key to Goal claiming the title of ‘the most shared publisher on social media’ is its content and distribution. Football is the world’s most popular sport and its stars, such as Ronaldo and Messi, are some of the biggest celebrities on the planet. This helps Goal to engage a global audience compared to rival publishers, such as Buzzfeed and CNN, whose fan base is concentrated in America. After all, only 17% of Facebook’s daily active users are in the U.S or Canada. What makes this even more remarkable is Goal is purely focussed on football, rather than other publishers who could focus on Brexit or Trump. Martyn Jones, Global GM at Goal said: “Football lends itself to providing stories that generate a range of emotions and we know that the most popular kind of content on social media is emotive content. “Young, socially-inclined, mobile-dependent and brand-savvy consumers are demanding a new type of sports content - content that is delivered in easily consumable and engaging formats across multiple channels. “We’ve been engaging football fans in digital media for over 10 years, innovating our approach to meet the rapidly evolving nature of content and consumption, which is why we’re uniquely positioned to engage with the new breed of fan. As demonstrated by Fractl’s research, the majority of Goal’s content is shared and interacted with through Facebook. But being a global brand, Goal has to operate across a number of platforms. Goal creates bespoke content for both Snapchat and Instagram, with the later having 1.4m followers. In Asia, Goal shares content through LINE (6m followers) and earlier launched a Chinese language edition in collaboration with Baidu. By the end of September, Goal will have expanded its presence on Facebook as its set to launch its first Facebook Messenger bot as well as Instant Articles.